The ZigZag quilt block inspired me to choose colours that are often associated with a Santa Fe appeal. So I had great fun playing around with the colours to choose and couldn't seem to quit. As a result, you will see a few different options as suggestions for what you might like to do with this five patch quilt block. This is a large quilt block, measuring 20" square as its finished size. So, that makes the final quilt go together faster, but due to the size of the block, there are more patches to create. I have added this quilt block to the intermediate category of difficulty simply due to the number of patches. 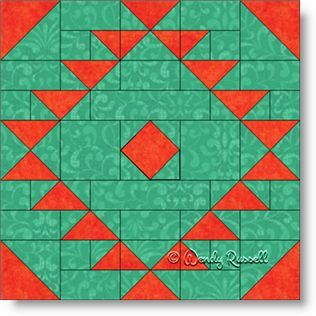 However, please do not hesitate to try making this block as it contains only squares, rectangles and half square triangles -- the three most frequently (and easiest) used patches in quiltmaking. The sample quilt illustrated uses a variety of colour combinations, but this quilt would look fabulous as a two colour quilt as well. I have also shown a couple of blocks (in the downloaded pattern) with all three fabrics used in a single block. So, it's yours to discover!